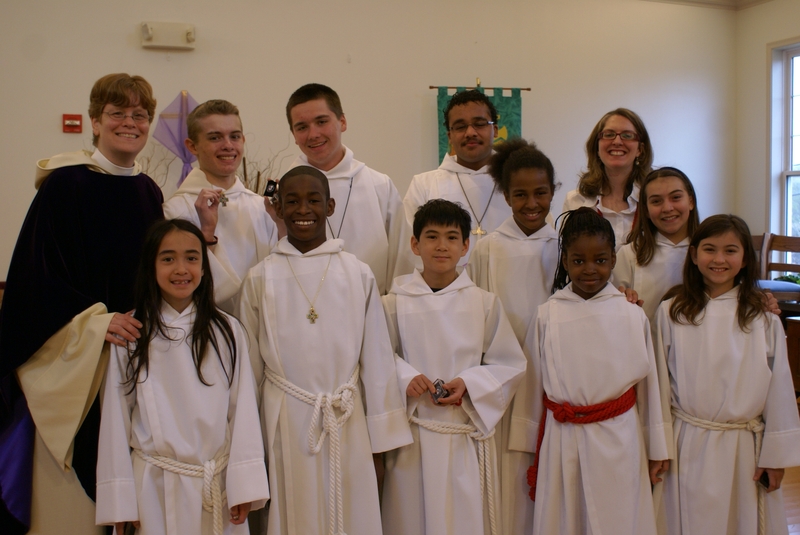 St. George’s Acolyte program is a unique and fun way for young people ages 7 to 18+ to serve our community of faith. The term Acolyte comes from the Greek word meaning “helper” or “attendant.” St. George’s Acolytes have important roles, assisting our rector at the altar during the worship service and leading the processional and recessional with the cross, candles, and a celebratory banner at special services. Our Aco lyte mentor program pairs experienced Acolytes with new “acolytes-in-training” to teach roles and responsibilities. As mentors, young people develop a new understanding of the liturgy and learn responsibility by introducing others to service. The relationships formed are rich and long-lasting. Members of the Altar Guild prepare the bread and wine, altar dressings, vestments and other items needed for the celebration of the Eucharist and other church services. Their work is a gift to the parish that adds to the beauty and order of worship. Altar Guild members enter into the sacred space of worship in a special way as they prepare the table for the priest and congregation. St. George’s Readers are an important part of the worship service. Lay members of the community participate in the service by reading one of the three lectionary selections prescribed for the day. These readings generally include passages from the Old Testament, New Testament and the Psalms. Lay Eucharistic Ministers (LEM) assist at worship by serving the chalice and otherwise assisting the priest during the Eucharistic feast. A LEM leads the Prayers of the People during the service and joins the priest in inviting all present to the table by raising the chalice as the priest raises the bread as we recognize God’s gift to the people gathered. Out in the community, our Eucharistic Visitors are trained volunteers who accept the bread and wine at the altar and take the Eucharist to the homebound and hospitalized. The St. George’s Prayer Chain provides parish members with an opportunity to offer intentional prayers on behalf of those who have requested prayers for themselves, their family members or friends during times of illness or other challenges. The first “welcome” a visitor receives on Sunday is a friendly “hello” from the Greeter. A Greeter stands at the door at the 10:00 AM service on Sundays welcoming everyone, and handing out service booklets and bulletins. If a newcomer joins us for worship, the Greeter will help her find a seat and asks that she sign our guest book. The Greeter also reminds us to wear our name tags! This simple ministry is an important part of our mission of welcome and community. Our Music Ministry enriches our worship by leading us in song. Their vocal and instrumental talents help us make a joyful noise unto the Lord. Our children add their own joyous rhythms to our recessional hymn. The missions of the music groups are to lead the congregation in singing hymns at 10:00 AM services, to provide music for special services during the church year, and occasional choir anthems. We have two distinct music groups: one that provides instrumental music and leads the congregation in singing hymns at 10:00 AM services and some special services, and another group (the Anthem Choir) that performs anthems and music for special occasions. We welcome anybody who loves to sing to join one or both groups. There is no requirement to be able to read music and we don’t audition. The Sunday service group, which also welcomes those who play musical instruments, practices every Wednesday evening from 7:30 to 9:00 PM. This special ministry comprises a dedicated group of St. Georgians who knit or crochet prayer shawls that are given to those in crisis. Created with loving care, these soft comforts are blessed in the sanctuary by the Rector with the prayers of the people.